The KMMN coalition says that none of that money goes for the most effective weapon: the insecticide DDT, which eradicated malaria in Europe and the United States more than half a century ago, but was banned in the United States in 1972 because of its supposed environmental effects. Soon, the World Health Organization and the U.S. Agency for International Development cut out DDT from its programs. Author-physician Michael Crichton described the results of the DDT ban this way: "It has killed more people than Hitler." That's because trying to stop every human-stinging mosquito is a dead man's game. They will find a way in. And during the three decades since DDT disappeared from the disease-fighting weapon rack, we've learned that the insecticide does not thin birds' eggshells dangerously or cause cancer among humans. Infants nursing when there's been heavy DDT spraying may gain weight a little more slowly than others, but that's a lot better than dying from malaria. The biggest of the three grants, $107.6 million, goes to Seattle-based Program for Appropriate Technology in Health (PATH) to develop a vaccine for malaria, which kills an estimated 2,000 African children a day. PATH's Malaria Vaccine Initiative will work with Belgium-based GlaxoSmithKline Biologicals, a unit of pharmaceutical company GlaxoSmithKline Inc., to test vaccine candidates. The other two grants go to Geneva, Switzerland-based nonprofit Medicines for Malaria Venture (MMV) and the Innovative Vector Control Consortium (IVCC). The IVCC, led by the Liverpool School of Tropical Medicine, will use the money to fast track development of insecticides and other mosquito control methods. Let's do both - use the proven insect killer and look for new methods. Good work. The Commerce Department's index of personal consumption expenditures — an inflation measure favored by Federal Reserve Chairman Alan Greenspan — rose at an annual rate of 3.7%. But without energy and food, the increase was only 1.3%, down from 1.7% in the second quarter. There is bad news - wages didn't keep up; they lagged behind the low inflation by 1.5%. And personal savings went below zero! But the overall news is good. And inventories are declining, which indicates that production shouldn't decline. So another good quarter is expected. I oppose conservative who take aim and shoot at their own. Wait for the hearings. It's one thing to have doubts about nominee Harriet Miers; to ask questions. But it's quite another to raise the bar. Since Judge Robert Bork was "Borked" in the 1980s we have asked for the nomination process to be fair. We have opposed the groups who focus only one getting rid of court nominees. People against the American Way; they say "for." NAARL National Abortion Rights League. To add injury and insult to the debate, our conservative pundits/leaders have joined the dirty campaign. David Frum formed an interest group and raised $300,000 to take out ads against Miers. Better Justice I expect their website to disappear now that they have defeated President Bush. Borkers Here is the list of people I have respected that I will now watch out for. What other self-inflicted wounds to they have for us? I don't have direct knowledge of these people: E.C. Birg, Ephraim (Fry) Wernick, Roger Clegg, George Conway, Michael Dokupil Go your own way. You have used up the credibility you had earned with me. I might trust your research, but I don't trust your judgment. This list is only those who raised $300,000 to take out ads. I have no problem with Robert Bork, John Fund and others who spoke. And Linda Chavez rejects email to the address she gives on her site. And they claim that they will force President Bush to nominate a Boston-Washington elite judge. Which seem to be their criteria of a qualified candidate, in others words a better nominee. But they handed a victory to Senator Chuckie Schumer and his gang. They didn't know there are politics in this process; Bush did. After defeating the president we will get a worse nominee. Europe, or at least the parts I go to, is a wonderful place to live and to visit. It's beautiful; the food is great; the people are generally warm and relaxed. If there is a greater pleasure than eating a plate of Insalata Caprese (tomatoes, mozzarella, basil and cold-pressed extra-virgin olive oil) on a sunny terrace on the Amalfi Coast with the islands where the Sirens lured Ulysses in the distance, then I haven't found it yet. But, when it comes to public policy, Europe has taken a wrong turn. And he asks if the US is going the way of Europe. My time for blogging is limited because I am taking a bass playing lesson. Music Dojo has online lessons for guitar players and bass guitar players of all levels. It's not a lot of time, but I have to put in time every day. Mrs. R. reports that Patty Murray is now speaking against the Coburn Amendment, and has just issued a threat against any Senators who vote for the amendment: we on the Appropriations Committee will take a "long, hard look" at any projects in your state. Can anyone say, "culture of corruption"? a sculpture park in Seattle, Washington, $200,000 to build an animal shelter in Westerly, RI, and $200,000 to build a parking lot in Omaha, Nebraska. While his service is free to the general public, Ziari is recovering the investment through contracts with more than 30 city and county agencies, as well as big farms such as Hale's, whose onion empire supplies over two-thirds of the red onions used by the Subway sandwich chain. Morrow County, for instance, pays $180,000 a year for Ziari's service. Each client, he said, pays not only for yearly access to the cloud but also for specialized applications such as a program that allows local officials to check parking meters remotely. "Internet service is only a small part of it. The same wireless system is used for surveillance, for intelligent traffic system, for intelligent transportation, for telemedicine and for distance education," said Ziari, who immigrated to the United States from the tiny Iranian town of Shahi on the Caspian Sea. It's revolutionizing the way business is conducted in this former frontier town. "Outside the cloud, I can't even get DSL," said Hale. "When I'm inside it, I can take a picture of one of my onions, plug it into my laptop and send it to the Subway guys in San Diego and say, 'Here's a picture of my crop.'" Productivity!! .... And about the technology. The WiFi we have in our homes has a range of 30 feet or so, more with an antenna, but still not very far. For longer distances there is "Wi-Max," which makes the rural coverage practical. JADIDAH, Iraq - Mohammed Hamed al-Obadi doesn't like the proposed constitution that Iraqis will vote up or down on Saturday. When he walks through the dusty streets of his Sunni Muslim neighborhood, very few people have much good to say about it. But, unanimously, they agree they'll vote to make it law. "It's time for the Sunni people to get involved in the democratic process," said the 50-year-old son of a Sunni tribal sheik. "We boycotted the vote last January, and we lost because of it. This time, we must show our support for one Iraq by approving this constitution, then we must make it work for us, from the inside." That attitude, to the extent that it's shared by other members of Iraq's Sunni minority, suggests a hopeful turn in Iraq's struggling democracy. Sunnis, roughly 20 percent of the population, were in control of the country under Saddam Hussein and they're now the backbone of the insurgency. U.S. and Iraqi leaders hope that broad Sunni participation in the constitutional vote and subsequent parliamentary elections will sap support for the insurgents. Yes, this vote undercuts the Islamist murderers. Especially the votes of the Sunnis. The French discover "petrole contre nourriture"
The United Nations' Iraq Oil for Food program is huge. Saddam Hussein was allowed to control billions of dollars that was supposed to feed his people; he was able buy almost anyting. And he was allowed to control people - to buy influence - with the money. It is clear that Kofi Annan allowed this misuse of the program. His highest diplomat Benon Sevan was involved. Kofi's son was involved. Now a high French displomat has been arrested. Claudia Rossett reports in the National Review. Even the French have finally discovered the United Nations Oil-for-Food scandal. With the arrest in Paris this week of a former French ambassador to the U.N., Jean-Bernard Merimee, alleged to have received illicit and lucrative contracts to buy oil from Saddam Hussein's U.N.-sanctioned regime, the French newspapers are now aflutter over "petrole contre nourriture." The funny thing is, while France had plenty to do with Oil-for-Food, Merimee's main trail leads not to the Quai d'Orsay, but to the doorstep of the U.N. secretary general. Rossett has done an outstanding job on this. It is by far the largest scandal ever in the humanitarian area. No one paid attention. But Rossett, working for the Wall Street Journal, kept following the crumbs without a big story for years. Then she fouhd the cake! Don't pay attention to the Pulitzer prize awards. They passed her over in favor of some reporter scandalizing President Bush. And why are we US taxpayers paying to keep corrupt Kofi in office? On May 15, 2005 in Khenchela, Algeria all eleven members of a water supply convoy are blown up or machine-gunned by the Salafist Group for Preaching and Combat.... On May 9 in Chakka, India - The Mujahideen open fire on civilians exiting a mosque, killing three and injuring an unknown number. These were Muslims killing Muslims. Look at the list for the past 365 days. It is astonishing. Update. 10/14/05 - Thailand The BBC reports that Thailand has major problem. Their southern provinces that adjoin Malaysia are being attacked by Islamists and killed almost every day. The continuing unrest in Thailand's Muslim-majority south has led to the deaths of about 950 people since the beginning of 2004, and shows no signs of abating. 950 deaths in less than 2 years; that's an average of about 2 people every day! Some of the insurgents blamed for a spiral of violence in southern Thailand were trained in Libya, a senior Thai defence official has claimed. General Pallop Pinmanee said the militants then used this training to teach many others in the south. But Thailand's defence minister said there was still no concrete evidence any insurgents had been trained abroad. Does China have too many People? China’s population is expected to peak at 1.44 billion by 2033 while the labor population is expected to no longer increase by 2011. However, the peak time came much earlier than expected thanks to that [sic] the national policy of family planning has worked and that the old-age population grow. As a result, the decline of the increase rate of the labor population has materialized in recent years. Statistics show the proportion of jobs and job hunters is increasing year by year in 117 cities nationwide, climbing as much as 95 percent in the second quarter in 2005 when compared with 65 percent in the first quarter of 2001. Xie believes the domestic labor force has already been driven from the stage of "limitless supply" into "limited surplus," and resulting labor supply gaps among some regions might occur throughout the country. Though employees consequently could receive higher pay, labor shortages may pose a new thorny problem, causing some economic growth slowdowns, Xie said. If you look at the comments for recent posts you will see deleted comments. All of those are spam. They don't address the content of the item they are attached to and they are self-serving; they give a link to a web site that is unrelated to the topic. Please leave a comment. NASA has made significant progress in one area - predicting earthquakes? The Times of India reports that a correlation has been discovered between major earthquakes and sun spots. This is not to say that the sun spot causes an earthquake. Rather, that it triggers a situation that is on the razor edge and the earthquake results. NASA, the National Aeronautic and Spac Administration, has unveiled a bold plan to put men back on the Moon in 13 years - that's 2018. The first time took 9 years. Now with 40 years' experience and far more advanced knowledge and manufacturing, we will take 50% longer? But read the fine print. The Moon is a step on the way to Mars. 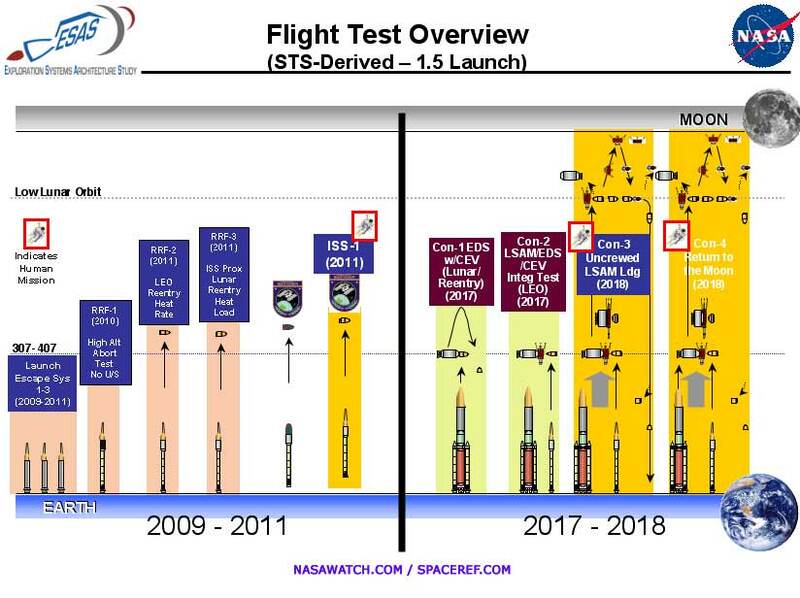 Going to the Moon will really be test flights (Is traveling in space flying?) for the procedures and hardware to get to Mars. But, still, why so long? Lots of people are asking and some are saying: Don't wait for the dinosaur. Let's do it ourselves. Private space ventures are the cheetahs. They care less about how big the organization chart is focus on the goal. We have already seen Burt Rutan and Paul Allen;s Space Ship One fly into space twice in one week. And it was installed in the Smithsonian National Air and Space Museum last week next to the Spirit of St. Louis. But their design concentrates on getting people to the edge of space, not to Earth orbit or beyone. But other entrepreneurs are aiming higher and their designs will be more suitable for earth orbit. (I need an example.) Holman Jenkins has good coverage in the Wall Street Journal. Subscription required, I am afraid. 3. What the Document Actually Says § The best way to dispel the paranoia of the conspiracy-mongers is to actually look at the document in question. It simply doesn’t advocate the views they attribute to it. § First and foremost, and contrary to the hysterical claims of some Darwinists, this document does not attack “science” or the “scientific method.” In fact, it is pro-science. What the document critiques is “scientific materialism,” which is the abuse of genuine science by those who claim that science supports the unscientific philosophy of materialism. § Second, the document does not propose replacing “science” or the “scientific method” with “God” or “religion.” Instead, it supports a science that is “consonant” (i.e., harmonious) with theism, rather than hostile to it. To support a science that is “consonant” with religion is not to claim that religion and science are the same thing. They clearly aren’t. But it is to deny the claim of scientific materialists that science is somehow anti-religious. § Following are the document’s major points, which we still are happy to affirm: (1) “The proposition that human beings are created in the image of God is one of the bedrock principles on which Western civilization is built. Its influence can be detected in most, if not all, of the West’s greatest achievements, including representative democracy, human rights, free enterprise, and progress in the arts and sciences.” As a historical matter, this statement happens to be true. The idea that humans are created in the image of God has had powerful positive cultural consequences. Only a member of a group with a name like the “New Orleans Secular Humanist Association” could find anything objectionable here. (By the way, isn’t it strange that a group supposedly promoting “theocracy” would praise “representative democracy” and “human rights”?) (2) “Yet a little over a century ago, this cardinal idea came under wholesale attack by intellectuals drawing on the discoveries of modern science. Debunking the traditional conceptions of both God and man, thinkers such as Charles Darwin, Karl Marx, and Sigmund Freud portrayed humans not as moral and spiritual beings, but as animals or machines who inhabited a universe ruled by purely impersonal forces and whose behavior and very throughts were dictated by the unbending forces of biology, chemistry, and environment.” This statement highlights one of the animating concerns of Discovery Institute as a public policy think tank. Leading nineteenth century intellectuals tried to hijack science to promote their own anti-religious agenda. This attempt to enlist science to support an anti-religious agenda continues to this day with Darwinists like Oxford’s Richard Dawkins, who boldly insists that Darwinism supports atheism. We continue to think that such claims are an abuse of genuine science, and that this abuse of real science has led to pernicious social consequences (such as the eugenics crusade pushed by Darwinist biologists early in the twentieth century). (3) “Discovery Institute’s Center... seeks nothing less than the overthrow of materialism and its cultural legacies.” It wants to “reverse the stifling dominance of the materialist worldview, and to replace it with a science consonant with Christian and theistic convictions.” We admit it: We want to end the abuse of science by Darwinists like Richard Dawkins and E.O. Wilson who try to use science to debunk religion, and we want to provide support for scientists and philosophers who think that real science is actually “consonant with… theistic convictions.” Please note, however: “Consonant with” means “in harmony with.” It does not mean “same as.” Recent developments in physics, cosmology, biochemistry, and related sciences may lead to a new harmony between science and religion. But that doesn’t mean we think religion and science are the same thing. We don’t. (4) “Without solid scholarship, research and argument, the project would be just another attempt to indoctrinate instead of persuade.” It is precisely because we are interested in encouraging intellectual exploration that the “Wedge Document” identified the “essential” component of its program as the support of scholarly “research, writing and publication.” The document makes clear that the primary goal of Discovery Institute’s program in this area is to support scholars so they can engage in research and publication Scholarship comes first. Accordingly, by far the largest program in the Center’s budget has been the awarding of research fellowships to biologists, philosophers of science, and other scholars to engage in research and writing. (5) “The best and truest research can languish unread and unused unless it is properly publicized.” It’s shocking but true—Discovery Institute actually promised to publicize the work of its scholars in the broader culture! What’s more, it wanted to engage Darwinists in academic debates at colleges and universities! We are happy to say that we still believe in vigorous and open discussion of our ideas, and we still do whatever we can to publicize the work of those we support. So much for the “secret” part of our supposed “conspiracy/” § A final thought: Don’t Darwinists have better ways to spend their time than inventing absurd conspiracy theories about their opponents? The longer Darwinists persist in spinning such urban legends, the more likely it is that fair-minded people will begin to question whether Darwinists know what they are talking about. To see the complete original text of the document and read a more detailed response go to: The Wedge Document: So What? If those opposed to Miers continue to speak out loudly (which is their right) and to claim that Bush lied (which I believe is just inaccurate) then maybe they will create some unease with the base. If they do, though, it will have been from the top down, rather than from the grassroots up. Maybe those opposed to the nomination will be successful in getting enough of the base to vote against Republicans in the 2006 and 2008 elections, or to just stay home. Do they think that we will then get better nominees, with Democrats in charge? Even those who hate this nomination, and hate Bush for making it, can’t really believe that. Can they? I can understand those disappointed in this candidate, and those who believe Bush missed an opportunity. I can even understand, though I don’t agree with, those who believe Bush broke a promise. But to say Bush “lied” is to say that when he said he would nominate those in the mold of Scalia and Thomas, he secretly intended not to do so. This interpretation of the word “lie” is just wrong. It is wrong the same way it was wrong when used by those who say Bush lied about WMD. To say he lied then, would mean that when he said Saddam possessed WMD, that he really knew no WMD existed. Do we really have to revisit the definition of what a lie is with those on the conservative side of the aisle? It is in our interest that President Bush succeed in getting Miers approved by the Senate and sitting on the Supreme Court. BTW, my best source for Supreme Court issues is Hugh Hewitt. I check Hugh every day. The news reports from New Orleans of multiple murders, rapes and other crimes in the Superdome and Convention Center during the flooding have been proven wrong. The murder count in the Superdome was zero. The reports of dozens of bodies stored in a freezer in the Superdome. Wrong. There were 6 bodies, 4 of natural causes, one suicide and one I don't recall, but it wasn't a murder. Why couldn't the Major Media get this one story correct? They were all there - the big TV networks, the 3 or 4 cable news networks, the major newspapers. They were all there, but they got it wrong. What was the effect? The Washington Post reports today that the delivery of aid was slowed. The news media hampered the rescue and relief efforts. The sensational accounts delayed rescue and evacuation efforts already hampered by poor planning and a lack of coordination among local, state and federal agencies. People rushing to the Gulf Coast to fly rescue helicopters or to distribute food, water and other aid steeled themselves for battle. In communities near and far, the seeds were planted that the victims of Katrina should be kept away, or at least handled with extreme caution. There was an unnerving amount of lawlessness, especially looting, in the streets of New Orleans after the hurricane. But many of the more salacious reports have not withstood close examination by government officials or the media. CNN reported repeatedly on Sept. 1, three days after Katrina ravaged New Orleans, that evacuations at the Superdome were suspended because "someone fired a shot at a helicopter." But Louisiana National Guard officials on the ground at the time now say that no helicopters came under attack and that evacuations were never stopped because of gunfire. Later that morning, during a briefing carried live on local radio and local and national television, Sen. Mary Landrieu (D-La.) said, "We have gotten reports, but unconfirmed, of some of our deputies and sheriffs that have either been injured or killed." Of the thousands of law enforcement officials who converged on New Orleans, only one was shot. The wound to the leg was self-inflicted in a struggle, a spokesman for the Guard said last week. The New Orleans Times-Picayune reported that National Guard troops found 30 to 40 bodies decomposing inside a freezer in the convention center, including a girl whose throat was slashed. The newspaper quoted a member of the Arkansas National Guard, which was deployed in the building. Other news organizations then passed the information on. That, too, was untrue. On Monday, Bob Johannessen, a spokesman for the Louisiana Department of Health and Hospitals, said that four bodies were found -- one was a gunshot victim. He said officials had no record of a dead girl with her throat cut. The Los Angeles Times said last week that its story about the evacuation of the Superdome "adopted a breathless tone." Jonathan Klein, president of CNN/US, said reporting was challenging because official sources -- in particular Compass, the police chief -- initially confirmed many of the things reported on the air. As more information has become available, Klein said, the network has corrected the record and highlighted the danger of swirling rumors. "We are ever vigilant about separating rumor from fact," Klein said. "This story is a good reminder of the need to do that." But who will hold the media responsible for the damage done by their repeatedly reporting rumors that had no source and were not true? Who will hold the media responsible for the aid that was delayed due to their false reporting? I saw two bald eagles 3 blocks from our home in Lake Forest Park, Washington. It's totally suburban. There is some habitat advantage - Lake Washington; across it is the entrance of the Sammamish Slough (so-called River); and two creeks cut through our neighborhood. Some pairs nest withing three miles. But there is also one of the busiest highways in the state of Washington, Bothell Way or state highway 522. Google Map - click on Satellite I was walking to our neighborhood shopping mall. As I approached Bothell Way I heard the high almost-screech sound. There were two of them circling each other right at the highway. I wish I had my camera. They stayed near and active for several minutes. I covered James Glassman's analysis of historical hurricane activity here on August 31. Giant hurricanes are rare, but they are not new. And they are not increasing. To the contrary. Just go to the website of the National Hurricane Center and check out a table that lists hurricanes by category and decade [when they hit the US mainland]. The peak for major hurricanes (categories 3,4,5) came in the decades of the 1930s, 1940s and 1950s, when such storms averaged 9 per decade. In the 1960s, there were 6 such storms; in the 1970s, 4; in the 1980s, 5; in the 1990s, 5; and for 2001-04, there were 3. Category 4 and 5 storms were also more prevalent in the past than they are now. As for Category 5 storms, there have been only three since the 1850s: in the decades of the 1930s, 1960s and 1990s. I made a chart of that data. Of course the current decade - which has no name yet, let's call it the 00s - is not yet half over. So I projected the data for it. Click on the chart to enlarge it. (Sorry it's not more legible - a hurried effort in Excel and Fireworks.) It is clear that the decades of the 70s, 80s and 90s has less strong hurricanes than usual. The 00s so far are on the higher side, but not any new extreme. So the number of strong hurricanes does not provide evidence that human activity has made the globe warmer. OK, Muslims don't eat pork. So don't make them eat pork. Clearly mark food packaging and they can avoid it. But banning Piglet? That's what they did. You want to think this is a joke, but it's not. The British are seriously caving. Charles Murray looks at the poverty we saw in New Orleans and raises the distinction between the poor and the underclass. Being poor means having low income and assets. The way out of poverty is well known - work. People who work do not remain poor. In the hurricane aftermath in New Orleans the poor did what they could to take care of themselves. But there were people who looted and women who didn't do what they could, but waited for someone else to provide for them. These people are the underclass. Murry covers this in the Wall Street Journal on 9/29. Here it is hosted at the American Enterprise Institute. We in the better parts of town haven't had to deal with the underclass for many years, having successfully erected screens that keep them from troubling us. We no longer have to send our children to school with their children. Except in the most progressive cities, the homeless have been taken off the streets. And most importantly, we have dealt with crime. This has led to a curious paradox: falling crime and a growing underclass. The big problem is unsocialized young men. The first mark is crime. The other symptom of the underclass is young men who choose no to work. Among black males ages 20-24, for example, the percentage who were not working or looking for work when the first numbers were gathered in 1954 was 9%. That figure grew during the 1960s and 1970s, stabilizing at around 20% during the 1980s. The proportion rose again, reaching 30% in 1999, a year when employers were frantically seeking workers for every level of job. The dropout rate among young white males is lower, but has been increasing faster than among blacks. These increases are not explained by changes in college enrollment or any other benign cause. Large numbers of healthy young men, at ages when labor force participation used to be close to universal, have dropped out. Why has the underclass grown during this time of increasing prosperity? In large part, I would argue, because the proportion of young males who have grown up without fathers has also risen relentlessly. The indicator here is the illegitimacy ratio--the percentage of live births that occur to single women. It was a minuscule 4% in the early 1950s, and it has risen substantially in every subsequent decade. The ratio reached the 25% milestone in 1988 and the 33% milestone in 1999. As of 2003, the figure was 35%--of all births, including whites. The black illegitimacy ratio in 2003 was 68%. By way of comparison: The illegitimacy ratio that caused Daniel Patrick Moynihan to proclaim the breakdown of the black family in the early 1960s was 24%. Does he think our government can improve this situation? Not by doing the things that have already failed - at huge expense. Hurricane Katrina temporarily blew away the screens that we have erected to keep the underclass out of sight and out of mind. We are now to be treated to a flurry of government efforts from politicians who are shocked, shocked, by what they saw. What comes next is depressingly predictable. Five years from now, the official evaluations will report that there were no statistically significant differences between the subsequent lives of people who got the government help and the lives of people in a control group. Newspapers will not carry that story, because no one will be interested any longer. No one will be interested because we will have long since replaced the screens, and long since forgotten. Then city officials and residents counted their blessings, thanking the dozens of volunteers who had arrived here after the storm and the donors who had sent money and supplies. People in the crowd saved their biggest applause for the Salvation Army. "They were the only ones here in the beginning," Eula Crowell, 57 years old, said after the meeting. She lost her house to the massive storm surge that inundated East Biloxi, where many of the city's poorest people live. For the past month, she has relied on the Salvation Army for water, hot meals, groceries and other basic goods. The group also gave her $50. The American Red Cross was mentioned at the meeting too, but in a different way. "We want to know where the money is," Ms. Crowell said when she cornered a Red Cross official who attended the gathering. "All these people across America are giving money over the TV. I would tell them to put it back in their pocket." Across the hurricane disaster zone, stretching from Alabama to Texas, an unexpected and unintended rivalry has developed between the two nonprofit organizations most closely associated with the aftermath of calamity. Here in some of the poorest parts of Mississippi and much of the Gulf Coast, the Salvation Army is drawing praise for its swift arrival in the most distressed areas and clearly winning the hearts of desperate residents. To some people here, the Red Cross, under growing criticism for letting bureaucratic hurdles slow down aid in the disaster area, suffers by comparison. The Salvation Army is helped by its military-style structure, which is designed for rapid mobilization and which puts a premium on training people in advance to deal with disasters. It can draw on more than 65,000 employees in the U.S., nearly double the paid staff of the Red Cross. The Salvation Army's daily work in permanent shelters with the homeless and poor and with people trying to put their lives back together after an apartment fire or years of alcohol and drug abuse helps too. The organization's focus on alleviating human suffering in the name of Jesus Christ resonates in this section of the Bible Belt. This past weekend, the organization housed 120,000 people in nearly 500 shelters across the country, split about evenly between people who evacuated for Katrina and Rita. The Red Cross is housing another 300,000 in hotels and has given 530,000 families some form of financial assistance.